Tarek Chemaly: On how to elect "man of the year" in the Arab region..
On how to elect "man of the year" in the Arab region..
Well, first let me say that the naming "person of the year" which engulfs both genders still did not make it to the Arab region, so we are still with "man of the year" - females need not apply. Lately I have been thinking how do such people get elected? I mean, apart from the usual "body of editors yada yada" - how do they get picked? I remember a discussion I once had with one such person in a position to decide and he said "you know this year I am going to pick someone from this sect (mentioning a specific religious denomination). So far there has never been a "man of the year" from "them" on the cover of the magazine." All right, so it boils down to a mix and match of religions then. That other people had stellar years, or gained key accounts and salvaged companies from bankruptcies is irrelevant, they simply don't happen to be from that "sect"- tough luck. In a different conversation with someone else, his main criteria from picking "man of the year" was the number of active accounts that man's company had, "they bring in advertising for our publication you see." Of course, silly me! The man he was speaking of had an incredibly unremarkable year, no better and no worse than the ones before it, but - hey - electing him man of the year would make him the goose that lays the golden eggs. A certain choice was based on - again from the words of a person who named a specific person - "but he's been in the industry for so long". I waited for the sentence to be continued, but apparently, that was not a comma but a full point. So, based on the number of years - never mind that the man's performance for the last two decades was much less than interesting and that he relented his position to his children, he still got to be "man of the year" along with the accolades that come with it. As you see, "man of the year" basically is a whimsical choice based mainly on shifting historico-economico-religious criteria with a generous sprinkle of many other unforeseen elements. 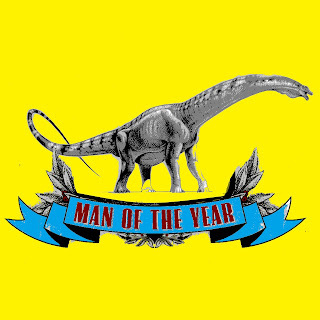 Next year, I am proposing to elect a dinosaur for that title. I mean, why not? My reasons are just as logical as the ones mentioned above!